Anchor Hooks are fasteners, threaded on the flat side. The are often used in the structural applications like securing walls to concrete foundations. The bent end hooks around rebar for support and may be cast in concrete for use as an anchor bolt.Their applications are also for the Tin Sheds where Square angles and Tin sheets are screwed. - Available in our 20 colors. We offer a wide range of Anchor Hooks that are known for their high efficiency, durability and wide functionality. 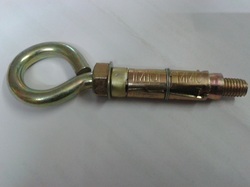 We offer these Anchor Hooks to our customers as specified by them. The forming is done in such a way, that the purpose of hooks is fully achieved. 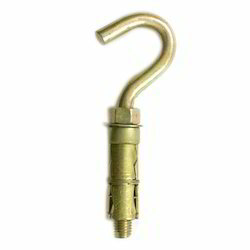 We are providing a comprehensive range of Anchor Hooks. These are made by experts who have affluent acquaintance of this field. Our customers can avail these products from us in varied patterns. Our selected quality experts stringently check our products before the final ship to the market. Best in quality and performance. Made of best quality material, this R Hook is designed to fit into GM and ford frame holes. These hooks made with rust proof low carbon alloy for taking heavy load with machine screw threads. standard: DIN, ANSI, BSW, AS, JS, ISO, ETC. stype: sleeve anchors, drop in anchors, eye anchors, hook anchors, anchor bolts, wedge anchors, toggle anchors etc.